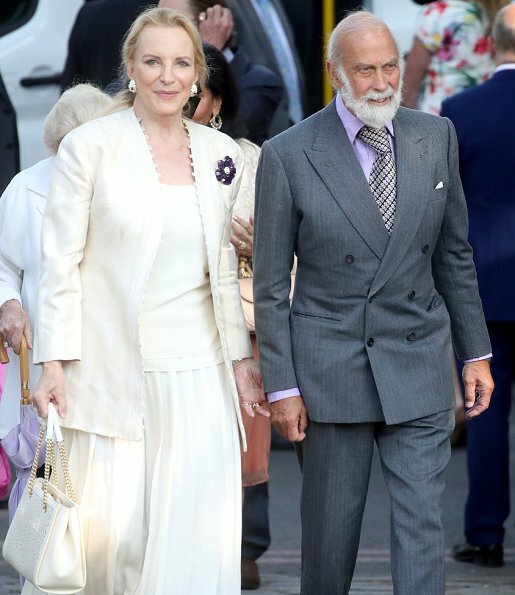 On May 21, 2018, Queen Elizabeth II, Countess Sophie of Wessex, Princess Anne, Princess and Prince Michael of Kent and Princess Beatrice attended the RHS Chelsea Flower Show 2018 held at the Royal Hospital Chelsea in London. 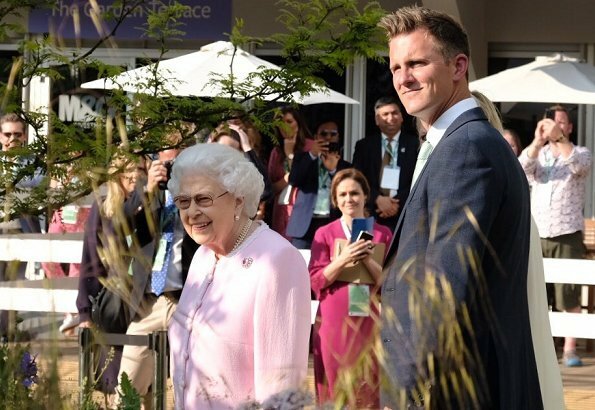 Established in 1913, the Chelsea Flower Show has become the pinnacle of the horticultural calendar and is one of The Queen’s favourite events to attend. Sophie looks so nice! Her dress is very pretty, so delicate and feminine. Her hair is up in such a neat and chic look. Great look for the flower show. Agree!! She looks fabulous, so fresh and stylish. 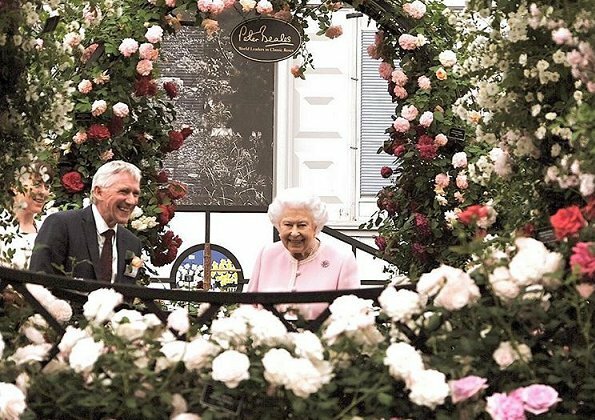 Her Majesty looks darling. Agree here too! She looks so pretty! Yes! -- such a pretty look, I hope we will see a lot more of this style on her. The royal family look excellent. Perfect outfits for the flower show. Maybe Princess Anne too formal? Love the colour she is wearing. 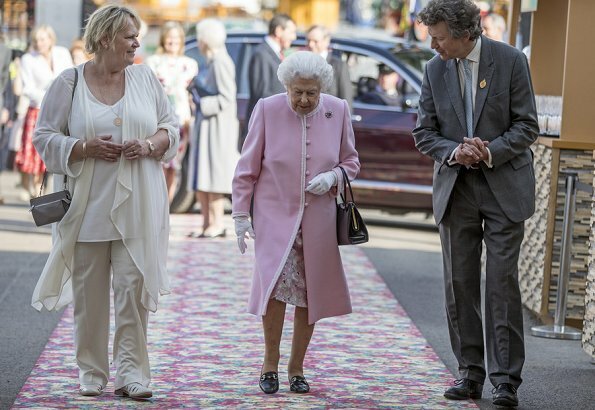 Love the Queen in pastel pink, Sophie looks great in the floaty dress and I really like Beatrice's dress. 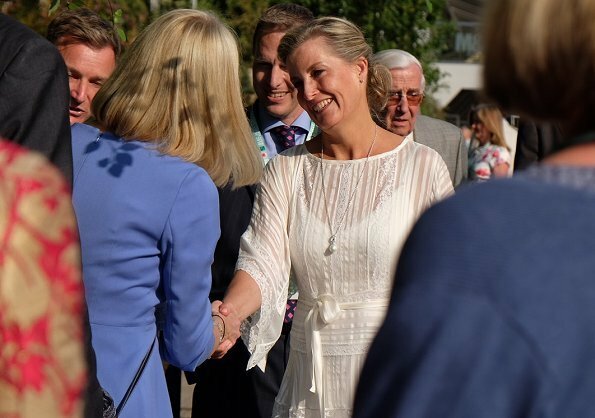 Anne is on my list of Royals Who Need to See a Hairdresser. I am so happy with Sophie's look, wonderful. That is a long time ago that i could say i like her outfit! Lovely. All members dressed appropriate - except Beatrice. Her dress is nice, the shoes too but you can't combine this black purse with a bright summer dress and the formal blazer also doesn't fit at all. I don't no why the York-Sisters rarely succeed to dress well. Queen Elisabeth in zartrosa und Herzogin Sophie in weiss , einfach passend und schön !! 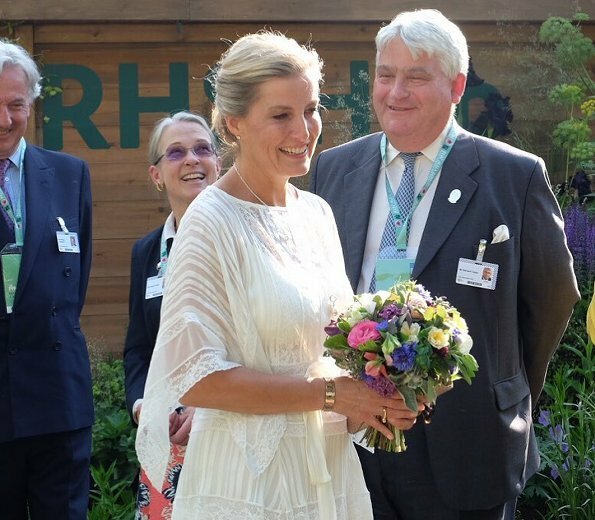 Ich finde das Kleid von Beatrice hier viel schöner, als das, welches sie bei der Hochzeit trug. The Queen, Princess Anne, Sophie Wessex and Princess Beatrice looked glorious! Love this occasion, perfect for showcasing pretty pastels, florals and creams. Everyone looks very nice. 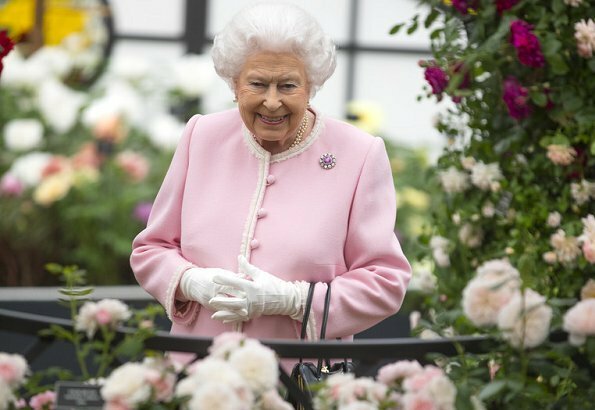 Like the light pink on the Queen and the white on Sophie.A nice day to enjoy beautiful flowers. Love Sophie's dress -- and am so glad she did not wear those ghastly gladiator sandals the model is wearing!! 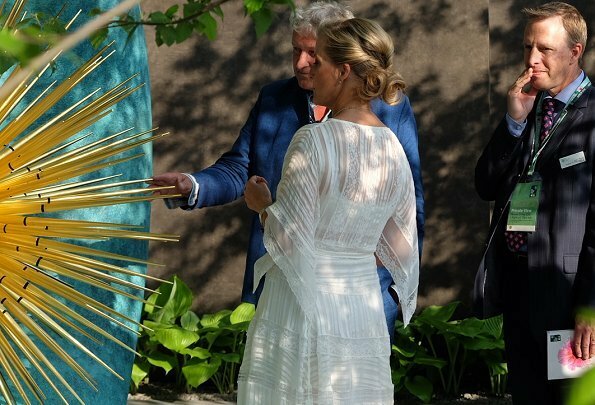 Why does she never wear a hat at this Flower show? Because the dress code states no hats. Im used to seeing the Queen in a hat or tiara. What snowy snowy hair she has! 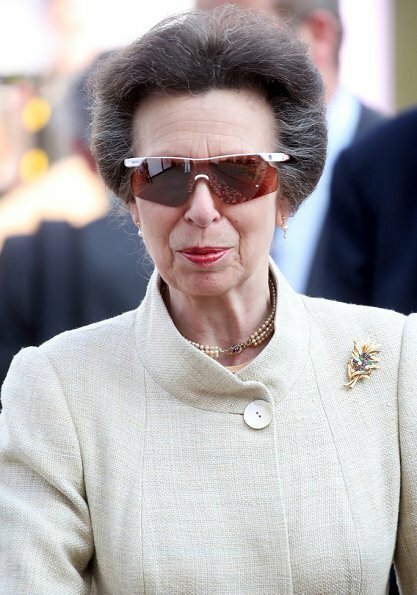 The Princess Royale must be a person with a large sense of humour (this sunglasses)and a special attitude when it comes to fashion. The same coiffur for ages and she wears what she wants - well in the lines of the protocoll of course. I like her for that actually. Sophie looks stunning! Her dress is beautiful and she has styled the dress beautifully too, I think she steals the show.